Oh, coffee cups…why do you mock me? Anyhow, the coffee cup passed with flying colors and went home with us. So far, so good after the first commute-with-the-new-cup. Meanwhile, the Lamenator9000 (aka, the “previous cup”) went back where I purchased it. No questions asked, which is a bit strange. Perhaps they’ll just slap it back on the shelf!?! My life over the past couple of years has been fraught with one “coffee cup woe” (TM) after another. Travel mug, coffee cup, beverage container, or what have you — I need them, and I can never find one that suits my fancy. You see, the issue is that my car (an early 90’s Saab 900 Turbo) doesn’t have cup holder, unless you count the slightly raised rings in the glovebox. <insert picture here> Those are difficult to use while driving. Actually, they’re pretty useless while you’re parked too, come to think of it. In fact, there aren’t a LOT of great solutions for a cup holder in a car like mine. Rather, I opt to find a good travel mug that won’t leak. Easy enough, right? Not so much. I tried a few Starbucks mugs — typically plastic cups (or mugs) with a threaded lid and a closeable top. I went through (4) of their mugs before giving up. They nearly all would leak — some worse than others — and all ended up broken at one point or another. The “clear plastic around inner plastic” models typically develop a crack between the handle and the lid, and become totally nasty when a little water gets in between the plastic layers. One of my cups had mold growing. That’s sick! One cup to rule them all. One cup to save them! I couldn’t use that cup any longer. (Well…. *that* and the fact that I ruined the lid trying to boil it and loosen the gunk.) No more OXO Good Grips LiquiSeal cup! So… I’ve purchase a new cup today, and it looks promising. 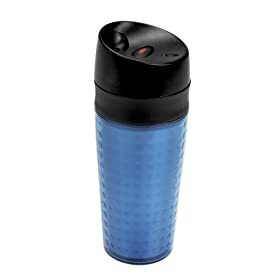 It’s the ThermoPerfect 16oz Vacuum-Insulated Travel Mug. More or less similar to the picture below. Know what else! It looks like you can *actually* CLEAN this thing! A novel idea. Anyhow, the “verdict” is most certainly out on the new cup, but I have high hopes.